A COMMANDO on a night training exercise in Thailand was accidentally shot by a local villager out hunting. First-Sergeant Woo Teng Hai, a regular from the 1st Commando Battalion, suffered head injuries in the incident on March 13. The 25-year-old serviceman was hit by pellets from a shotgun, the Defence Ministry told The Straits Times yesterday. He is now on medical leave. Mindef spokesman Darius Lim said 1st Sgt Woo was taking part in a 'routine training exercise' in a 'designated training area' in Kanchanaburi province, west of Bangkok. But the story was not complete. It was missing a very material piece of information. Another SAF servicement had been shot. He is a 19-year-old NSF. More than two months after the accident, the shotgun pellets are still lodged in his cheekbones and shoulder. How did these facts now come to light? Did Mindef tell the public about it? Nope. Mindef kept very quiet about it. Instead it was an unnamed relative of the NSF who called the Straits Times, to report it. NOT one but two Singapore Armed Forces (SAF) soldiers were hurt while out on a night military exercise in Thailand in March. A local farmer out hunting accidentally shot Private J. Pritheery Raj, a full-time national serviceman (NSF). Two shotgun pellets are still lodged in his cheekbones and his right shoulder. The 19-year-old is now on medical leave. News of this second shooting surfaced after a relative of Pte Raj called The Straits Times on reading its report that a villager had fired his shotgun at First Sergeant Woo Teng Hai. The regular commando is said to have been blinded in his right eye. The Defence Ministry, which had confirmed the accidental shooting of 1st Sgt Woo on Monday, admitted yesterday that another soldier had also been hurt in the same incident. It was a cover-up. Exposed by the NSF's relative. This is a simple example of why Singaporeans do not trust the SAF. All too often, the SAF just does not behave with integrity. My only hope is that the SAF will treat both servicemen - the regular and the NSF - fairly, and give them proper compensation. And not treat them in the the way they had treated ex-NSF serviceman Lawrence Leow. A few readers have asked why I have been blogging less and less frequently. One colleague expressed his "disappointment". Another reader asked if everything was okay in my life. Well, everything is okay. Except that I've been too busy with various things (mostly work and family), to be blogging a lot. That's one answer, and it is true. However, another answer (equally true) is that I just don't feel that interested in blogging anymore. In fact I have been feeling distinterested for some time. It seems a waste to just abandon the blog, especially when I've kept it going for quite a few years. On the other hand, to keep it going just for the sake of keeping it going also seems to be an illogical decision. Well, everything is impermanent. Blogs are no exception. Most of the Singapore bloggers whom I once considered as my "contemporaries" have largely vanished from the scene as well. That includes Xeno Boy; Molly Meek; Singapore Angle and Singabloodypore. I wonder how many people even remember those blogs/bloggers now. I've noticed that the less I blog, the less I bother to keep up with the news. Once upon a time, reading the online Straits Times was pretty much a daily habit for me. Now, many days might pass, before I bother to read it once. I still read Today quite frequently, but mostly because I often get handed a free copy while on the way to work. Due to my regular inattention to the news, I feel somewhat out of touch with this country now. Nevertheless my life goes on smoothly. Sounds a little strange, but it seems eminently possible to get by just fine in one's own life, without knowing too much about the broader national developments. I mean developments in areas like politics, government, education, healthcare, the economy etc. Maybe the nature of the world now is that people can just easily zero in on the specific information they need, when they need it. For example, you don't need to be reading the newspapers regularly, to know what's happening in the property market. Instead, right at the time when you want to know, you can just google to find out what you want to know. And you could get much more relevant, detailed information from a few dedicated property websites, than from the mainstream media. I've considered blogging about topics other than current affairs. To some extent, I've already done it. In many of my posts this year, I have often mixed news articles with personal anecdotes drawn from my own everyday experiences. Then again, perhaps the most important question is whether I'm wasting my time blogging here. And whether I should be doing something else. 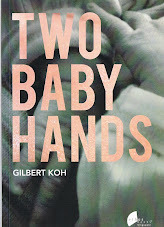 It's been almost a year since my book Two Baby Hands was published. Part of me feels that it's high time I got started on a second book (I'm considering short stories - I have plenty of ideas floating around in my head). But writing a book takes a lot of time, and I'm not a full-time writer. To succeed, I need to decide exactly what I want to do or not, and after that, I just have to avoid spending any time on things that I don't want to do. So the question for myself is - do I want to blog, or not? Hmmm. Well, this is one hotel that I will be avoiding, at least for the next one or two years. Hope they get their act together, by then. ORGANISERS of the first conference held at Marina Bay Sands (MBS) are looking into taking action against the integrated resort (IR) for the problems which plagued the event from the word go. They say MBS failed to deliver the 'unmatched guest experience' it promised when it first signed the deal early last year. Mr Yap Wai Ming, chairman of this year's organising committee for the Inter-Pacific Bar Association (IPBA) conference, said they will take stock of all the things that went wrong before meeting MBS to discuss the issue. He did not give a date for the meeting. The IPBA conference, a prestigious meeting of lawyers now into its 20th year, was the first event hosted at the IR, which threw open its doors on April 27 after months of delay. More than 1,000 lawyers and judges from all over the world, including the United States, Japan and Chile, attended the meet, which started on Sunday and ended yesterday. - At the five-star Marina Bay Sands Hotel, some delegates spent the first night without air conditioning. - Some guests had to make calls using their mobile phones because the room phones were not working. - Some rooms had no hot water or working toilet flushes. - Facilities like the gymnasium, spa and swimming pool were not ready for use. But the problems did not end at the hotel rooms. At the Sands Expo and Convention Centre, sound quality in the conference rooms was poor, and meetings were interrupted by construction noise or worse. Mr Yap said an IPBA committee meeting had to be reconvened along a corridor because of loud piped music playing in the meeting room. He said MBS told them it was unable to turn the music off as the sound engineer was not around. To add insult to injury, the power went out for more than half an hour in the conference room on Tuesday during the address by the Chief Justice of the Australian state of New South Wales. The inadequacies so irked the delegates that one of them, lawyer Axel Reeg from Germany, raised a motion during the annual general meeting (AGM) yesterday that the association take a 'fair and tough stance' against MBS for not delivering what it promised. 'The conference has been world class. The venue was presented to us as going to be world class. Sadly, it is not yet world class...I think we should rename Marina Bay Sands to Construction Bay,' the 51-year-old told the assembled lawyers at the AGM. Mr Yap said MBS should have been more honest about the progress of the IR right from the start, when it knew that its planned opening last December would have to be pushed back because of unforeseen construction setbacks and labour shortages. One of my lawyer friends, who was staying over at the hotel for the conference, told me that the hotel even messed up the check-in/check-out times for their guests. Five hours before my friend was due to check out, the hotel staff thought that she and her husband had already checked out. The hotel staff assigned the room to a new guest and insisted on sending his luggage to my friend's room. My friend had to tell them exasperatedly, "Wait, WAIT. You are making a mistake. This is MY room. You can't give a stranger a key to enter into MY room. This is a security breach!!" She also telephoned several times to ask for mineral water, but it never came. Oh, and she had to use her own handphone to call. The telephone in her hotel room was not working. There were other horror stories - about hotel guests getting stuck in lifts etc. In one case, the lift worked, but only partially - the door opened only halfway, so the hotel guests had to squeeze their way out. A terrible start, for the highly-billed IR. What happened to the quality control?